December 2016 - Sarasota Real Estate Inventory Up 30%, Will Prices Drop? The Average Sold Price per Square Footage was up 1.1% compared to the previous month and up 1.1% compared to last year. The Median Sold Price increased by 2.1% from last month. The Average Sold Price also increased by 3.4% from last month. 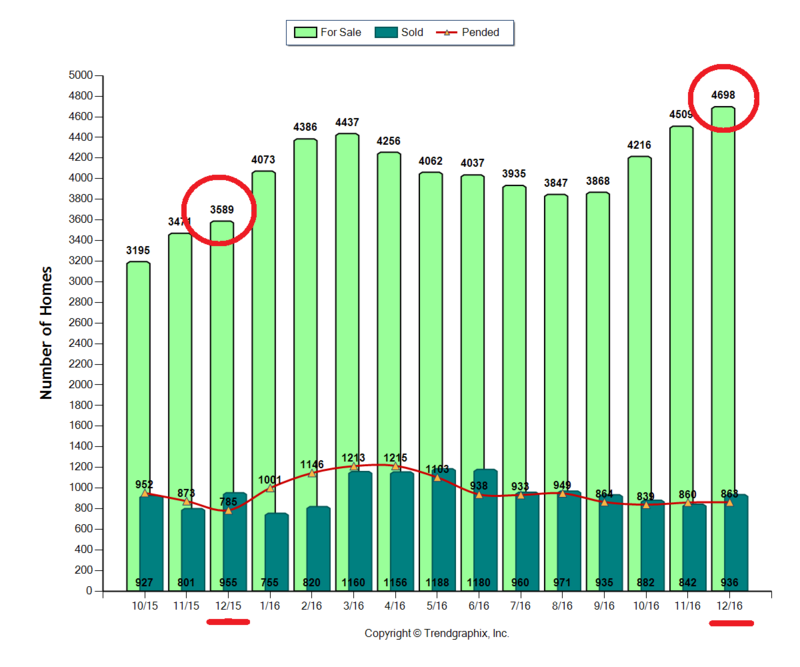 Based on the 6 month trend, the Average Sold Price trend is "Neutral" and the Median Sold Price trend is "Appreciating". The Average Days on Market showed a neutral trend, an increase of 11.1% compared to the previous year. The ratio of Sold Price vs. Original List Price is 92%, a decrease of 1.1% compared to the previous year. December property sales were 936, down 2% from 955 in December of 2015 and 11.2% higher than the 842 sales last month. Versus last year, the total number of properties available this month is higher by 1109 units of 30.9%. This year's bigger inventory means that buyers who waited to buy may have bigger selection to choose from. The number of current inventory is up 4.2% compared to the previous month. There was an increase of 0.3% in the pended properties in December,with 863 properties versus 860 last month. This month's pendedproperty sales were 9.9% higher than at this time last year. Keep monitoring the number of properties for sale, pended and sold (supply and demand). Sellers need to objectively compare their properties with the competition. Being objective is really hard for some sellers. Sellers need to know that they are also competing with builders. Most builder inventories are not included in the numbers above. Buyers have more homes and condos to choose from. Make sure your Realtor is aware of this. These numbers can be useful in negotiating a better price. This will most likely be your biggest purchase or sale. Do you want to work with a professional, full time agent? If so, contact us.